Sea of Thieves developer Rare has announced that Cursed Sails, a sizable free update, is coming to the game at the end of the month. Cursed Sails, which is “the most substantial update yet,” according to Rare, will be adding some new and challenging foes to the game, and a new Alliance system. “Cursed Sails will change things forever on the Sea of Thieves, as the sails you see cresting the horizon are no longer guaranteed to be other players making their own way through the world. The decks beneath those masts may now be manned by skeletal marauders returned to the seas from their restless graves,” Rare wrote in a post. 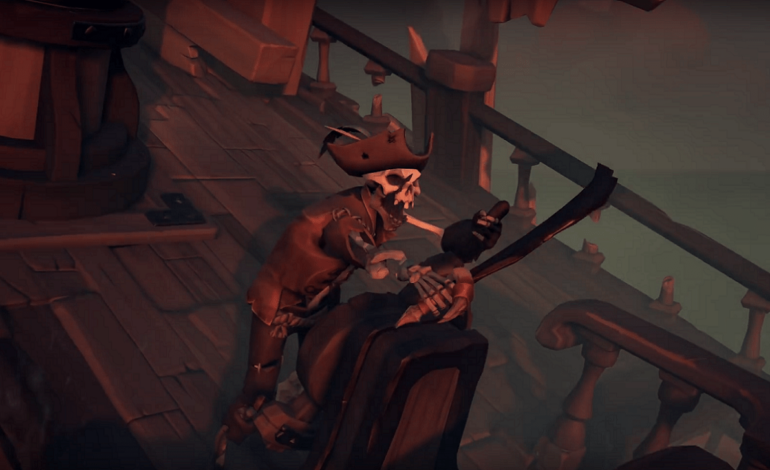 “All that sustains these grinning terrors is a thirst for battle that leads them to terrorise Outposts and call out defenders to face them on the tides…” Literal skeleton crews stalking the seas may spell trouble for players, but more content in the update is designed to give players an edge against such foes. Sea of Thieves is available now for Xbox One and PC. Cursed Sails arrives on July 31.